I don’t know about you but now that cooler weather is upon us, I am so looking forward to all the holiday festivities! Between prepping Thanksgiving Dinner, clipping those Black Friday coupons, hanging twinkling lights, or ringing in the New Year with champs and fireworks – the holidays definitely keep me busy! 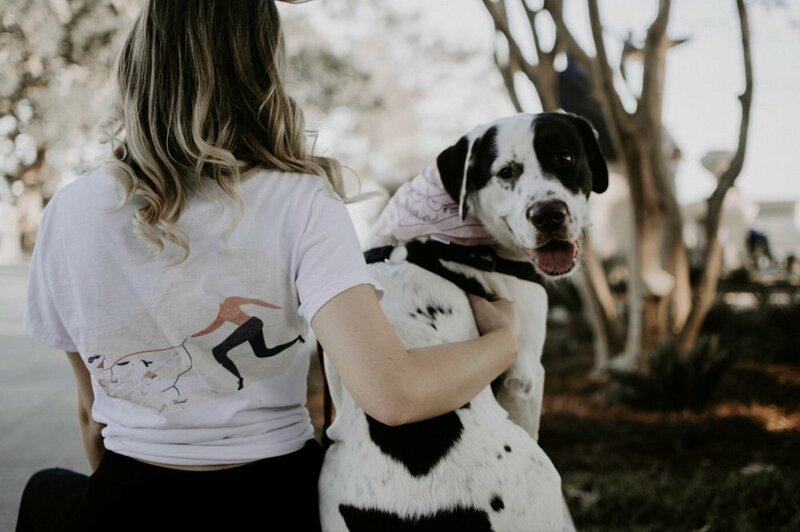 That’s why my line of Bones and Blogs Official Dog Mom T-shirts are perfect for all of your errand running this holiday season. I have designed 3 shirts with comfort, versatility, affordability, and dog moms in mind! These shirts are perfect athleisure staples or you can dress them up for a cute and casual day-outfit! 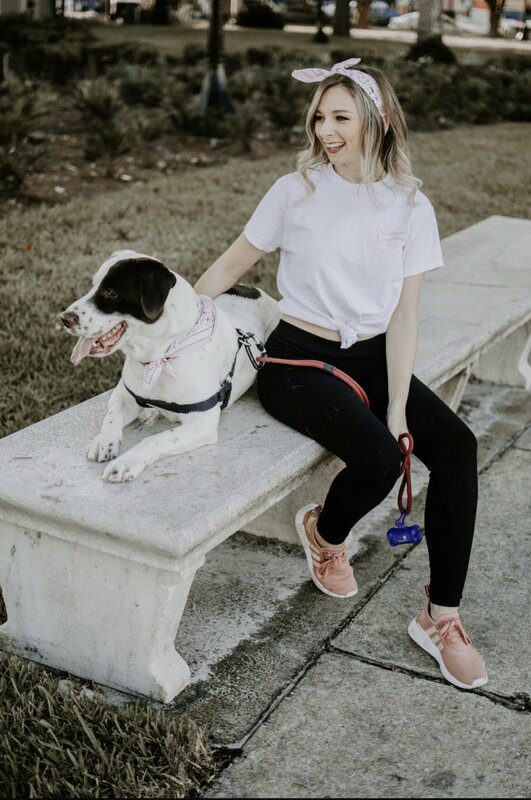 I am going to break each shirt down and show you different ways to style them, why they would make the perfect Christmas gift for any dog mom in your life, FAQ’s, and how you can give back to pups in need by purchasing one of these shirts! This is your classic cotton white t-shirt with our official *updated* logo. I would say this is perfect for men or women – real men wear pink right? In the summer I like to tie the shirt up over a pair of denim, in the cooler months I like to pair it with a cardigan, beanie, and leggings – which is my weekend uniform! This is perfect for all my girly dog moms! The pink is a true “look-at-me-pink”. We also kept our original logo on this design – the Labrador on the back is my actual dogs face! Yes he is that handsome in real life. I love wearing this as a casual outfit with jeans and flats, it also doubles as THE BEST sleep shirt. Last but certainly not least, everyone’s favorite! This classic black and white is a perfect staple for basics. It can by styled so many different ways! I find myself wearing this the most on outings with my dogs i.e. hikes, lunches, and dog parks! I usually tie it up, the looser fit keeps me cool, but the knot in the front makes for easy wear! This would also be so cute with leggings, boots, and a big blanket scarf – which is probably what I will be wearing for the next couple of months, haha! I donate 100% off all profits I make to a local shelter in my area. A local animal shelter in my area has an increasingly high kill rate :( this is the only shelter in this town and it absolutely breaks my heart to think that all the stray or abandoned pets in this area will have little to no chance at life. That’s why I donate 100% off all the profits I make to help run a more sustainable shelter. With more food, blankets, pillows, sheets, food, money for vaccinations coming in – it cuts down the amount of euthanizations. To break it down 80% of the profits made from shirts is what is used to pay for the shirts, materials, printing, and embroidery – the remaining 20% profit is ALL donated to the aforementioned shelter. So to clarify, I make $0.00 by making and selling these shirts… I truly do it for my love of dogs and their moms! • Sizes range from S, M, L – I plan to expand on these sizes to cater to more woman once demand starts to grow!